Lake Orta is a modest lake in Piedmont – thirteen kilometres long and less than four kilometres wide. Embraced by wooded hills, soaring mountains and tiny villages which hug the shore or cling to mountainsides, it has been described as ‘God’s Watercolour’ – a title adored by its devoted lovers. In the minds of the romantically inclined, Lake Orta seems to exist in a heavenly state of eternal sunshine and clear, blue skies. It is nature itself, however, with its capricious ability for transformation, that falsifies such a notion. The deep allure of the lake can only be fully and powerfully experienced through the staggering contrast of beautiful with sinister; light and dark – the two faces of the same coin. Admittedly, what we read about a place influences the way we see it in our minds and makes us build expectations. 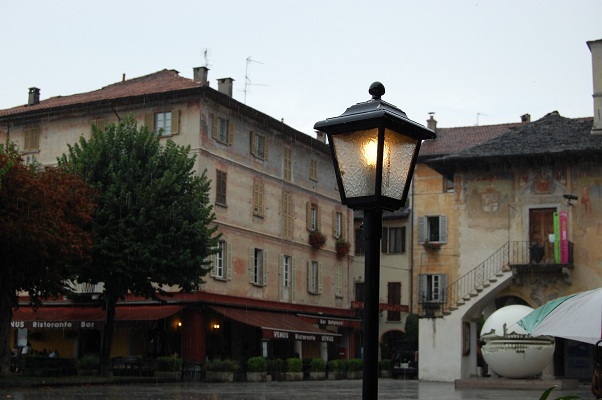 Thus when I visited Lake Orta for the first time, it unsettled me. Instead of a postcard setting, I was faced with a bleak, sinister landscape shrouded in gloomy cloud. Mist and drizzle smudged all outlines and the jagged mountain peaks were hazy, merging softly into the thick sky. There was no blue sheet of reflective water. The lake was black; bottomless. The heart of the lake, the town of Orta San Giulio, had a nostalgic feel about it, and beneath the charcoal sky, it seemed like a place in mourning. 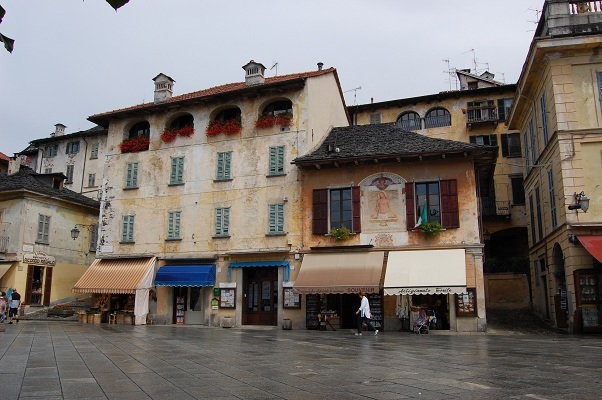 I walked along Orta’s deserted main street, Via Olina, past an array of empty shops – delicatessen, souvenirs, jewellery, ice-cream boutiques, restaurants and cafés. A couple of forlorn shop owners stared at me as I trudged along the pebble-surfaced street beneath a barrage of heavy raindrops. When Piazza Motta opened up in front of me, I sheltered beneath the arched portico of Palazzo della Communità, a 16th century edifice with frescoed outer walls. The piazza was desolate, and the only signs of movement were the rivulets of rain water that slithered over the cobbles. A red tourist train was parked by the tree line. Inside, a small group of tourists huddled together against the chill air, pulling long faces and frowning at the sky. I dashed beneath a large awning in front of Piccolo Bar, occupied one of the many vacant tables, and ordered an eye-opening espresso. Just opposite, the Island of Saint Giulio stood like a mirage. Screened by rain, its ancient edifices were drab; their dark windows like the hollow eye sockets of a skull. At that moment I was flushed by a warm empathy for the long departed saint, as I tried to imagine how, imbibed with the superstitions of the 4th century, he must have felt at the prospect of crossing over to the mysterious island then believed to be the lair of satanic creatures. He had decided to complete his church-building vow by building the hundredth and last church right on that secluded island. Boatmen refused to ferry him across but spurred by his relentless faith, he spread his cloak over the water and rowed himself across with his walking stick. The evil creatures were banished to make way for the basilica that still stands after so many centuries. Echoing San Giulio’s miracles, the sky opened up like the curtain of a great stage and in the space of a heartbeat I found myself in a different place. Colours brightened up and the thousands of rain drops that clung to everything sparkled like jewels. The lake became a polished mirror that doubled the beauty of its surroundings. The Island of San Giulio stood out of its reflection like Atlantis rising from the depths, crested with virgin, misty cloud; a promise of paradise. I decided not to cross over to the island on a floating cloak, an item which has long fallen out of fashion since San Giulio’s days, but instead, opted for a more conventional boat ride. The moment I set foot on the island’s jetty, silence rolled over me like a cuddling melody. Inside San Giulio’s basilica, a group of taciturn visitors gently dispersed to reveal the splendid grey-green Romanesque marble pulpit, with its sculpted, grim-faced figure wielding a walking stick and his entourage of mythical creatures. Beneath, in the dim crypt, San Giulio was still very present, his remains conserved in an ornamental, transparent cask. I left the basilica to tread the circular Via del Silenzio, the Way of Silence. The route was punctuated by multilingual signs that exalted the virtues of silence. ‘Silence is music and harmony,’ said one of them. Done in reverse, this route becomes the Way of Meditation. Offshoot lanes lead to waterside jetties where the owners of the splendid lakeshore villas moored their boats. As I walked past the Benedictine nuns’ convent, I crossed a newly-wed couple walking with dreamy faces and clasping each others’ hand. The route brought me back to my starting point and I stepped into Antica Bottega, the island’s only shop. Signora Maria Antonietta is one of the two island’s permanent residents, apart from the nuns. She was born on the island and has lived there ever since, even after her beloved husband passed away. Her shop was spotless. The well-ordered displays of china, lace-embroidered tablecloths, old prints, handmade wooden toys and colourful jewellery boxes were a poignant reminder of better times. Following the isolation of the island, Orta San Giulio, now alive and cheerful, was a different world altogether. Rambling along the piazza and narrow streets, I was treated with delightful little surprises: the quaint soap shop in the corner whose wafting scents were a promise of happiness, just like the warm-heartedness of the lady inside; the little secluded garden of the Palazzo Communale, that revealed itself unexpectedly to entertain me with its charming roses and picture-perfect views of the lake; the sumptuous villas and gardens of Via Fava overlooking the lake, that filled me with pleasant fantasies. Lake Orta, with its dark and bright aspects, is highly evocative of human nature. It is easy to think of it as a living being rather than a landmark, and maybe that is why so many people fall desperately in love with it. Japanese storyteller Junichiro Tanizaki wrote, ‘Find beauty not only in the thing itself but in the pattern of shadows, the light and dark which the thing provides.’ Lake Orta, like an intriguing personality, can only be fully understood if its charming face is appreciated in the full realisation of its shadowy, mysterious facet. The sinister provides depth and contrast against which the beautiful can dazzle.